"What would you do if you won the Mega Millions lottery jackpot?" This question was asked around nearly every water cooler in the country until the record-breaking $656-million jackpot found a home. Even people who are well aware that the odds of winning were one in 176 million thought it was worth buying a few tickets so they could join their friends in dreaming about how they would spend all that money. Day dreaming in your cubicle of spending a filthy amount of lottery money is harmless. However, don't let that day dreaming of writing fat checks carry over when you examine how much seemingly free money you’ve been promised by your efile tax return. As a culture, we are not the best when it comes to choosing to save money instead of spend it right away. Surely you've heard the phrase "This money is burning a hole in my pocket." This emphasis on spending now and thinking there will be more checks than bills around the corner is what contributed to our devastating housing bubble and consumer debt crisis. Psychologists have long known that if you offer a child $5 now or tell him he can have $10 if he waits a week, he will probably take the Lincoln. Before you get carried away thinking about how to spend the tax return that isn’t even in the mail yet, resist the temptation to seek instant gratification and wait until the money is in the bank. I realize that recent cinematic masterpieces like "Puss in Boots" by DreamWorks looked infinitely better on your friends HD 3D Blu-Ray Netflix-enabled flat screen TV. Despite you begin nerd-texting your buddy about 1080p resolutions and contrast ratios, please don't go spend that tax refund on a new TV before the feds even send the check. Better yet, don’t even pick out which TV you are going to get until the money is in hand. When we start to dream of spending money we don't yet have, we become so emotionally invested in the coveted item that we will buy that item even if we know it's not the responsible choice at the time. If every time you look at your current and disappointing TV you think of how much better your Friday night marathon of "Teen Mom" will be on that 60” flat screen, it's going to be that much harder to spend the return money on routine expenses that you forgot to include in your budget. Traveling for pleasure is one of those things we all say we love, but can never seem to scrounge up enough money for a proper trip. Music lessons for the kids, worm medicine for the dog, get out of the doghouse apology jewelry - that traveling budget line always seems to be the first to get squeezed out. As tempting as it may be to lock in the best price on plane tickets to Euro Disney as soon as you are notified of a forthcoming refund, you need to resist. Why should you resist indulging in the charms of a Styrofoam princess castle in a continent full of real castles that used to house real princesses; simply because every person needs an emergency fund. Picture this: you bought nonrefundable plane tickets for three months from now. Then in two months your car breaks down. Now you don’t have the money to fix your car, and you can’t get to work and make enough money to eventually pay for that family vacation. Instead, hold off on booking the trip until the refund is in your account and you’ve started an emergency fund for life's unexpected surprises. This will also help you avoid the pitfall of using that $1,000 refund to plan a trip that balloons to over twice that amount. The simplest reason you shouldn't spend a tax return that you are yet to receive is that there may have been a mistake. 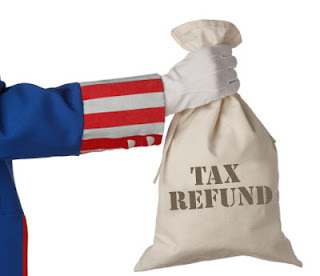 TurboTax may say that you are entitled to a return, but make one mistake while inputting your financial information and Uncle Sam may soon be telling you, "I want you, to fork over more money. There is a war and a jobs crisis I'm working on here!" As much as you are dying to get your hands on the new iPad so you can play the new outer space Angry Birds game, wait until the check clears. iPads will still be there, and with the accelerated rate at which new tablets enter the market, there may be something even better by the time you are actually ready to make a responsible purchase. No matter how real the promised tax return money feels, it's just a fantasy until your bank tells you it's there. If you feel the need to spend the money first, then do it - but only on paper. It’s not very often that we receive Unexpected Non-Reoccurring Income (UNRI). Think hard about how it should be spent - and then wait until it's really yours before you spend a penny. Divorce can leave you strained financially, and getting that fat check from the IRS may have you going a little spending crazy. It is important to spend this money wisely and save save save! You make a good point about the possibility of an IRS error. If you spend the money right away you won't have it if it turns out there is an error. You will then need to go into tax court to fight it or work out a payment plan.